Every now and then, there is an exhibition that we feel we just have to see, and usually one holds out until it (hopefully) comes to London. 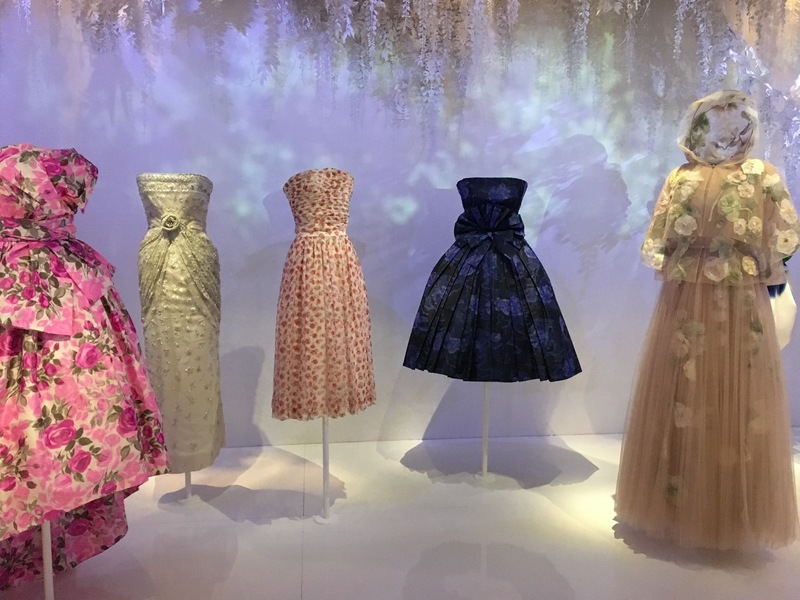 However the risk of missing out on ‘Christian Dior: Designer of Dreams’ at Musee Des Arts Decoratifs was one that was too great and we felt compelled to go. 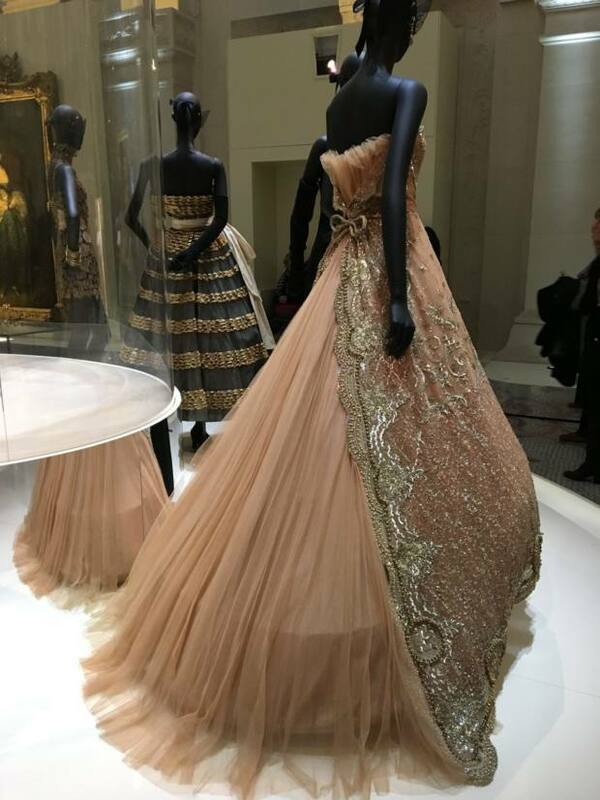 So last month, Natasha made the trip to Paris to see the much hyped display. 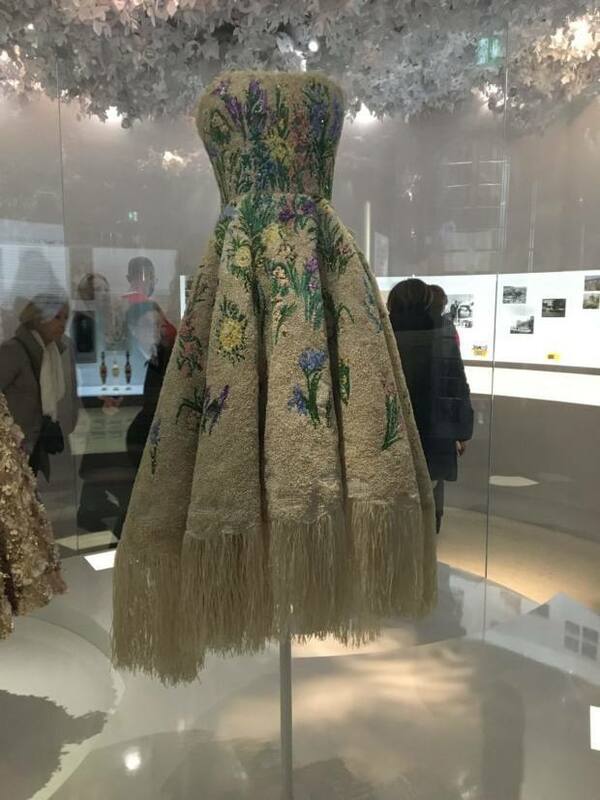 The exhibition begins with some history about Christian Dior’s family and his life before setting up the house as an art gallery owner and fashion illustrator. A brief introduction to the facets of the house it followed by the first main gallery. In this room, each section is divided by colour, each cabinate displaying a pallette with a variety of dresses, 12” minatures and accessories. 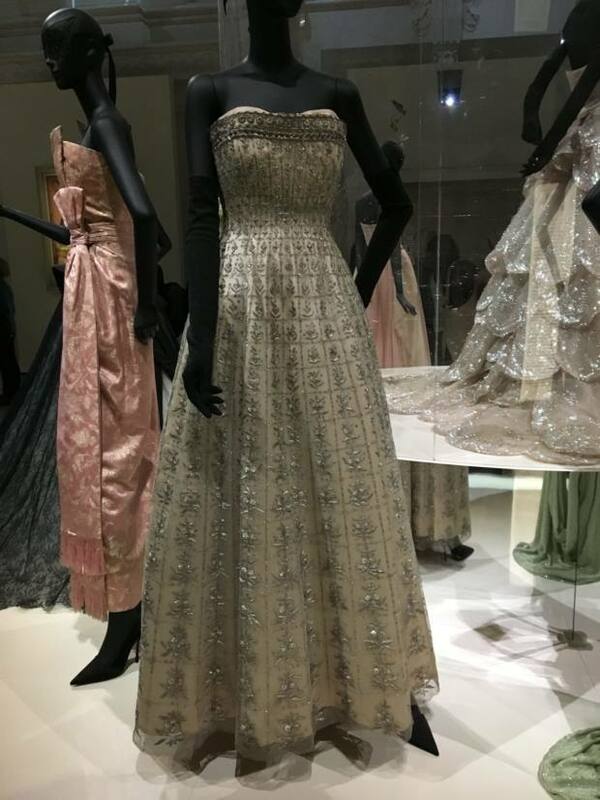 As an embroiderer, one of the most outstanding aspects of this exhibition was the level of detail you could see in the gowns and the emphasis that was placed on showing off the incredible textures. 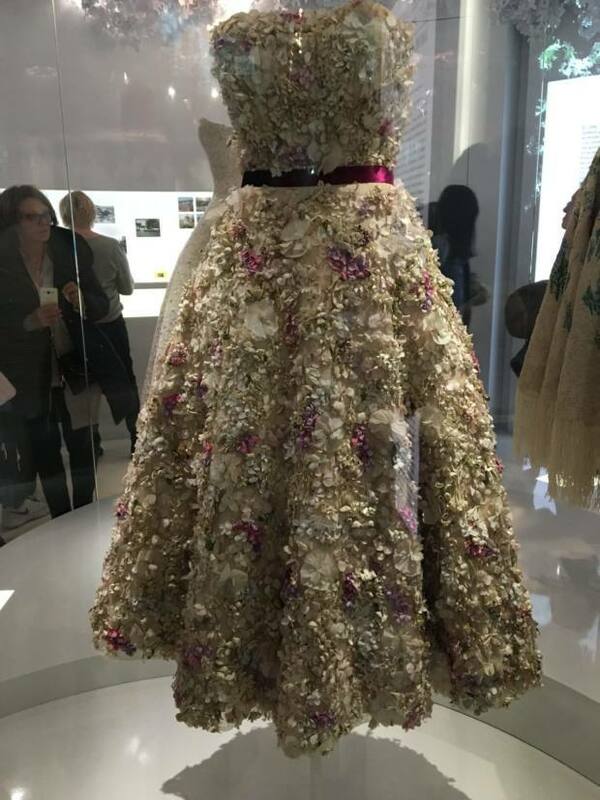 These were reflected in the papercut flowers and foliage that hung from the ceiling in a few of the rooms which were inspired by the fragrances that make up Dior’s famous perfumes. 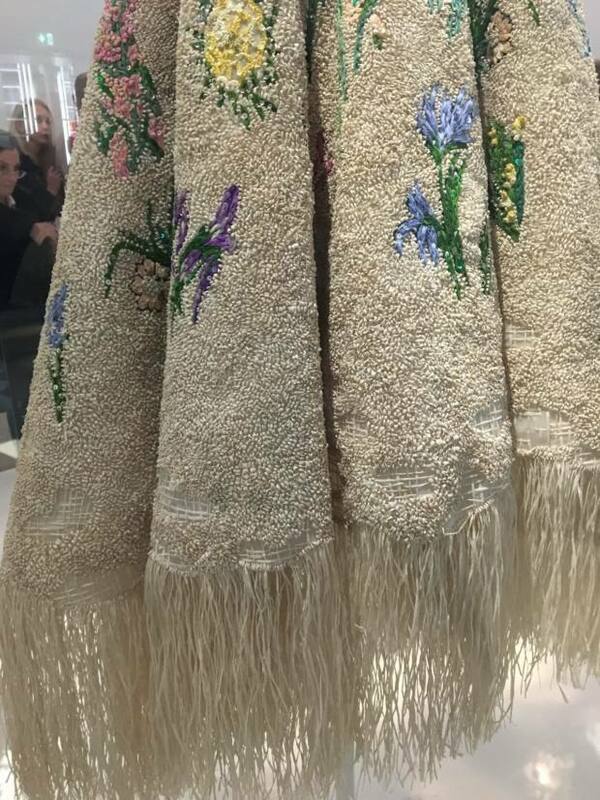 Some of the textiles could be descibed as quite tradtional beading, whilst others would be considered to be more experimental, playing with feathers and layering but all were undeniably beautiful. 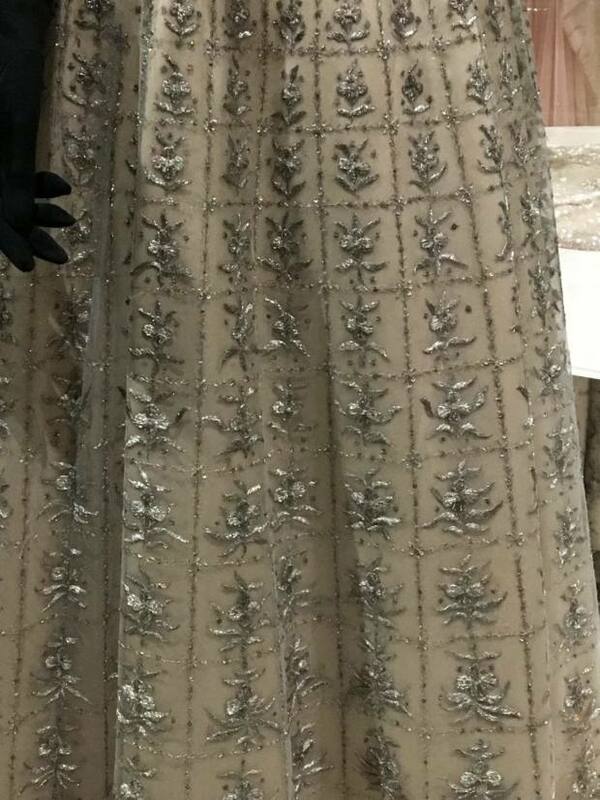 They also had an in house embroiderer demonstrating some tambour beading onto a panel of one of the gown and chatting with the public about what she was doing. The piece was framed up in a large slate frame, with one end complete and, the other drafted on. 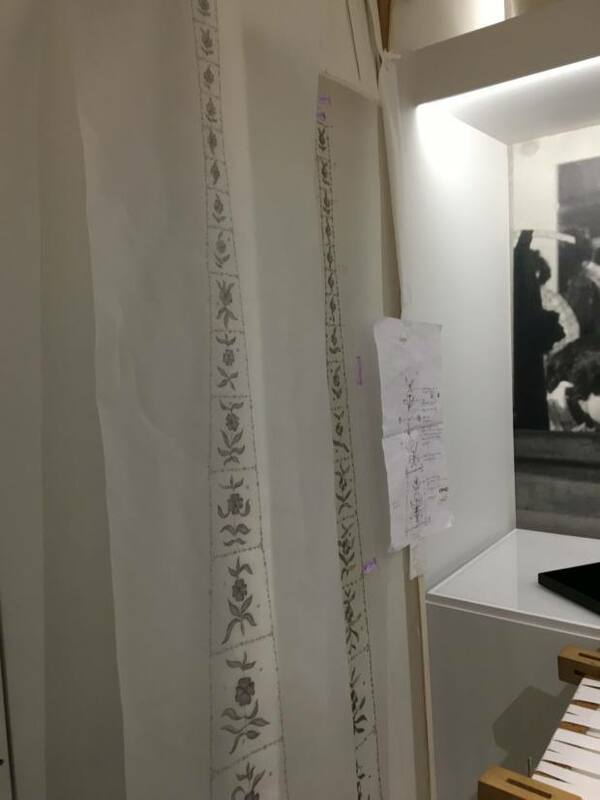 The drafts and drawings for the piece were hanging to one side of her with a partically completed gown on display behind her. 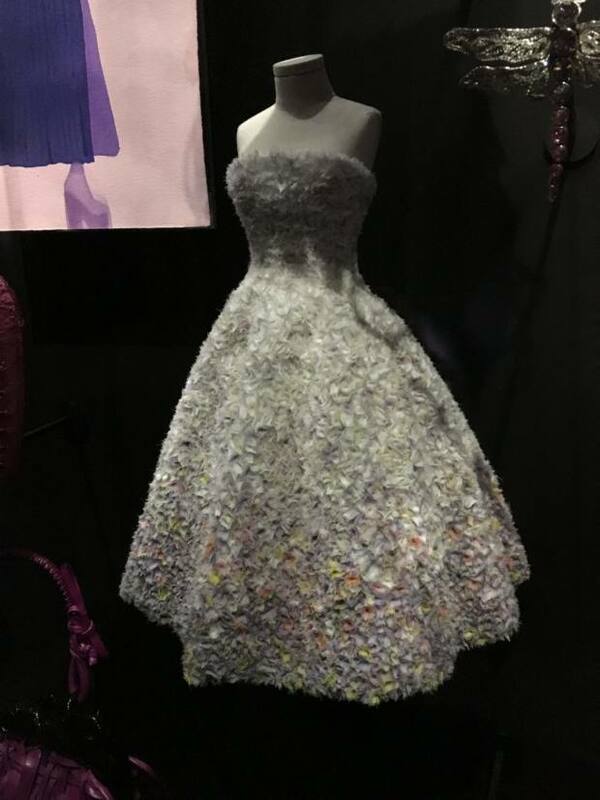 The finished gown was part of the final gallery to put the whole process into context. 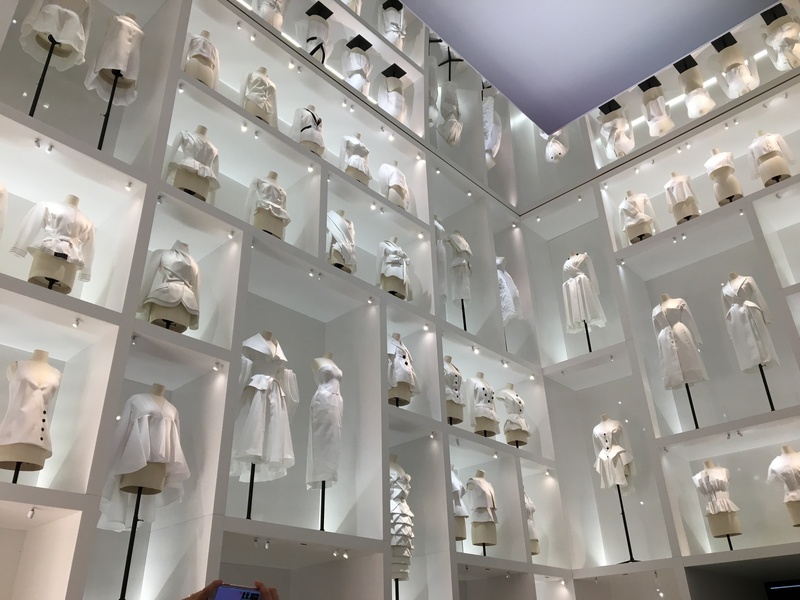 The white gallery was reminiscent of the layout of the Savage Beauty exhibition at the V&A museum in London where you were dwarfed by the pieces, however here the emphasis was placed purely on the cut of the garments. 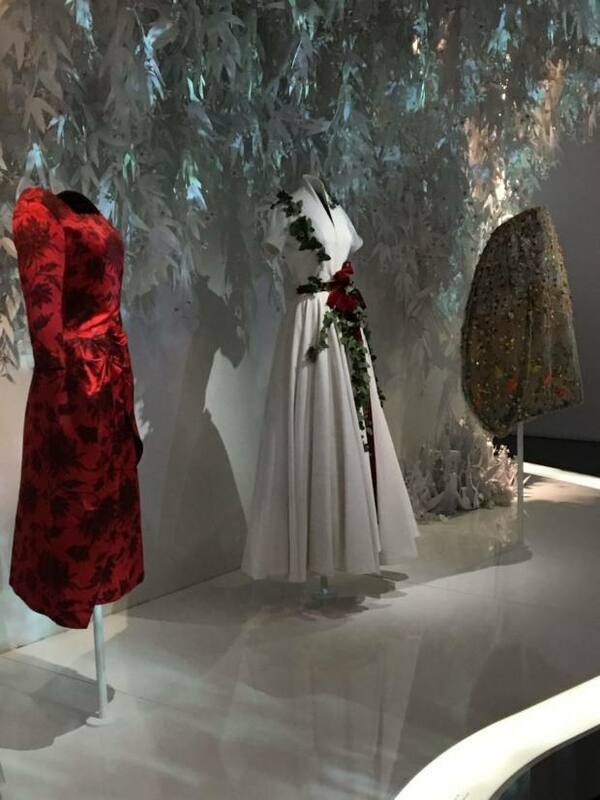 Each one is the toile of a gown we had already seen in the body of the exhibition to explain the development of each piece and the alterations process it has been through to get to the final design. 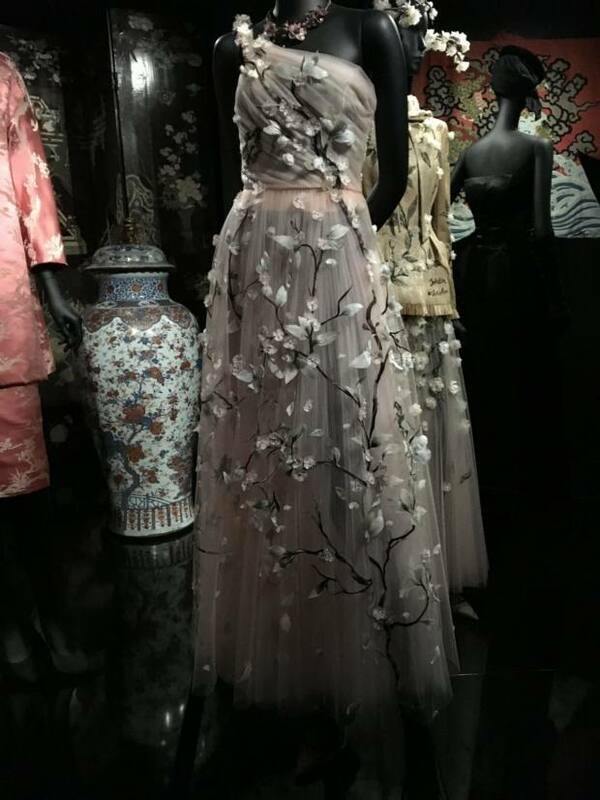 Final last gallery was all the real show stopping gowns, the space itself adds to the gravity of the items on display. 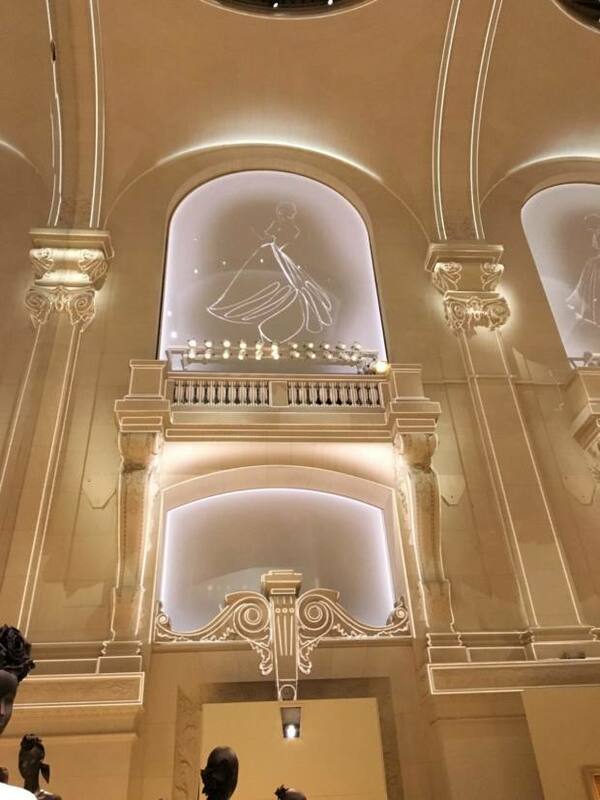 They enhanced the experience with moving light displays across the walls which gave the impression of gold snow, unashamedly playing up to the couture fairytale. It would be fair to say this exhibition was excellent, going around it all took at least 2 and a half hours going through it all but one could have stayed much longer. The amount of pieces on display and the generous space that was given to each one made it a very leisurely experience. I really enjoyed the way they played with scale in the lay out, starting off the with minatures gallery, then allowing you to get up close with the real sized pieces and then emmersing you in the white and final galleries. 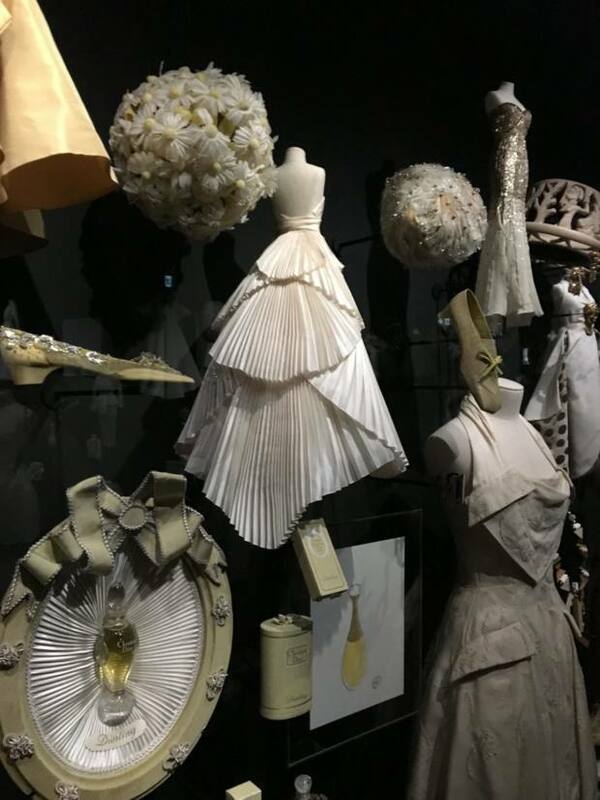 If you would like to read another perspective on the exhibition, have a read of Tina Isaac-Goizé’s thoughts for Vogue here. 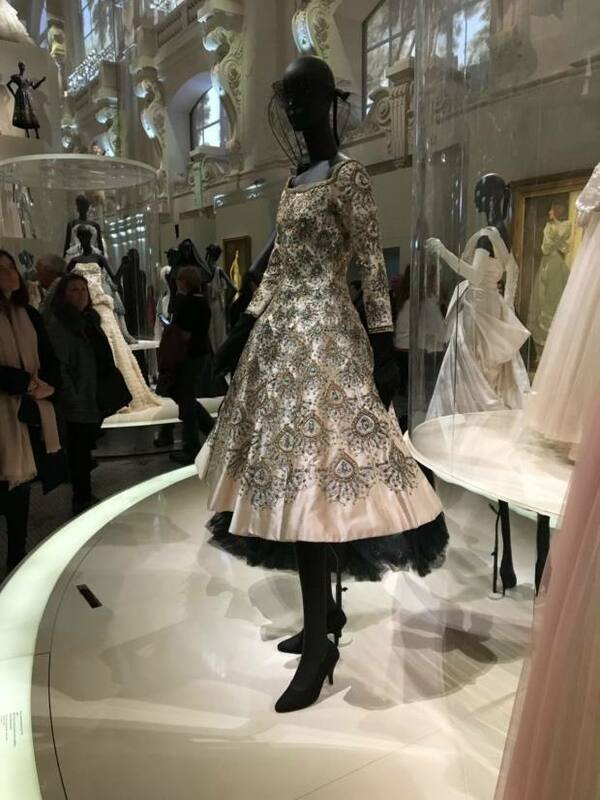 ‘Christian Dior: Designer of Dreams’ is on show at Musee Des Arts Decoratifs in Paris until 7th Jan 2018 so catch it while you have the chance! 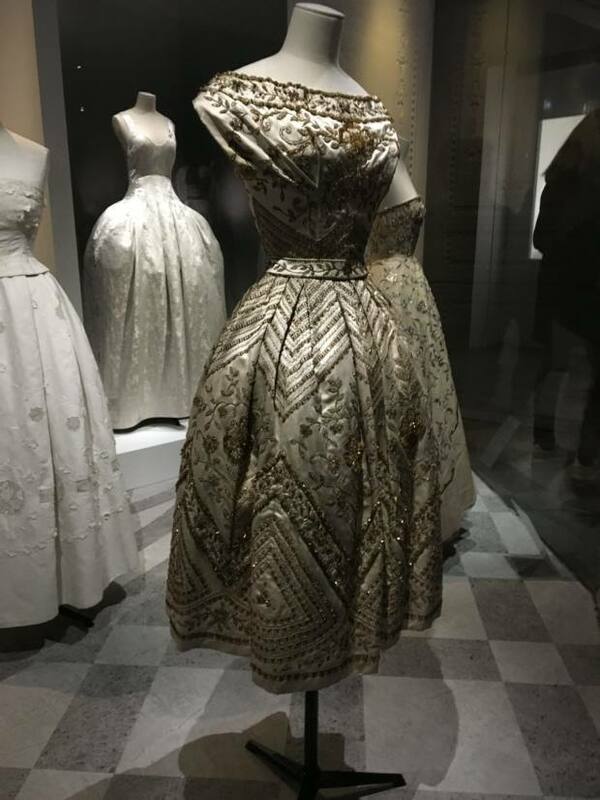 When a major fashion exhibtion comes to London, we love to go and see what it is all about and the Balenciaga: Shaping Fashion Exhibition currently on at the Victoria and Albert Museum does not disappoint. 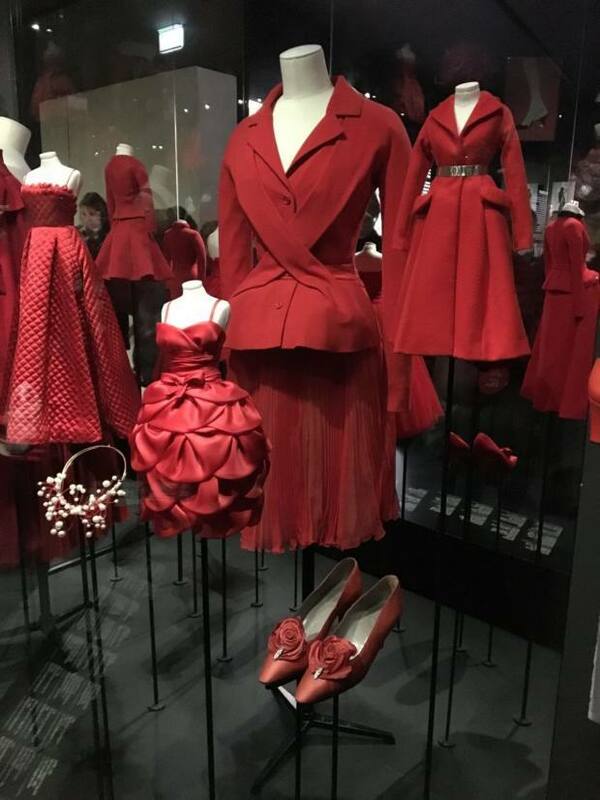 Based in the fashion and textiles section of the museum, the exhibition goes through from the beginnings of Balenciaga as a brand, through to current designers that Balenciaga has influenced. 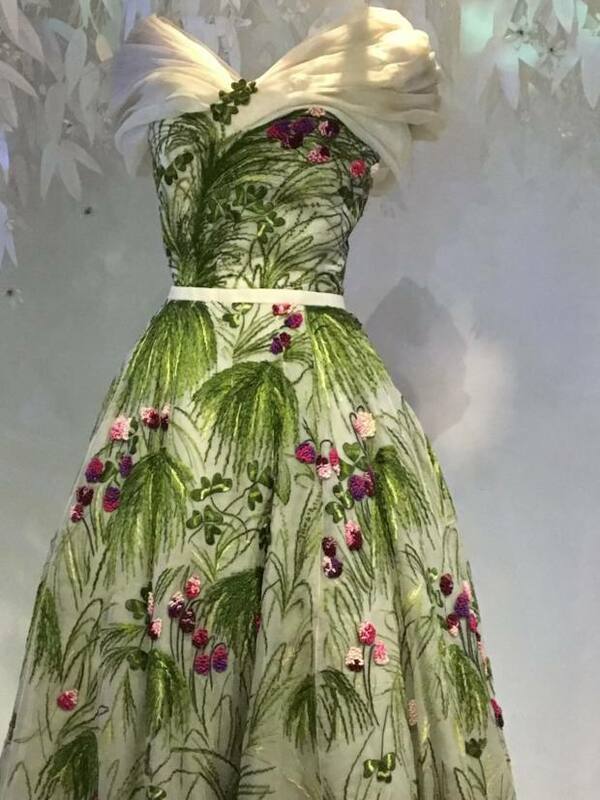 This accompanies the actual garment which it explains as well as a calico toile of the garment. 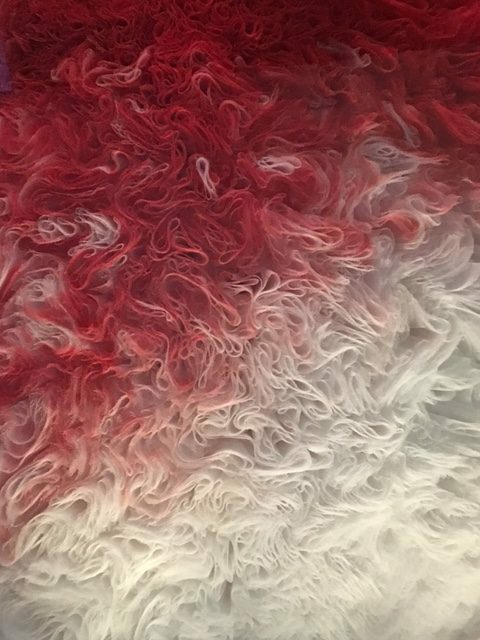 A few pieces from the collection have been x-rayed as can be seen in the back of the next video which shows the many layers that go into a piece like this and the hidden support within some of the ‘simpler’ looking gowns. 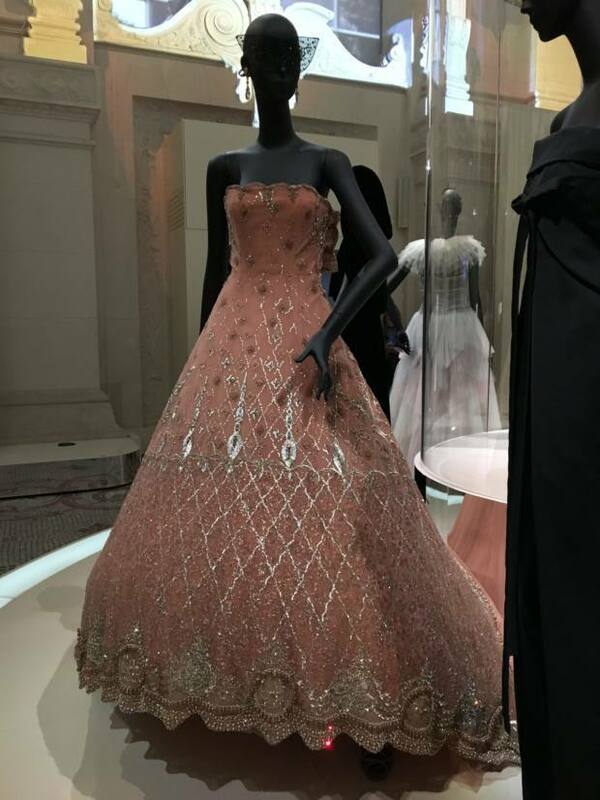 They have a section which is dedicated to the fabric choices and embroideries used in some of the historical Balenciaga pieces. 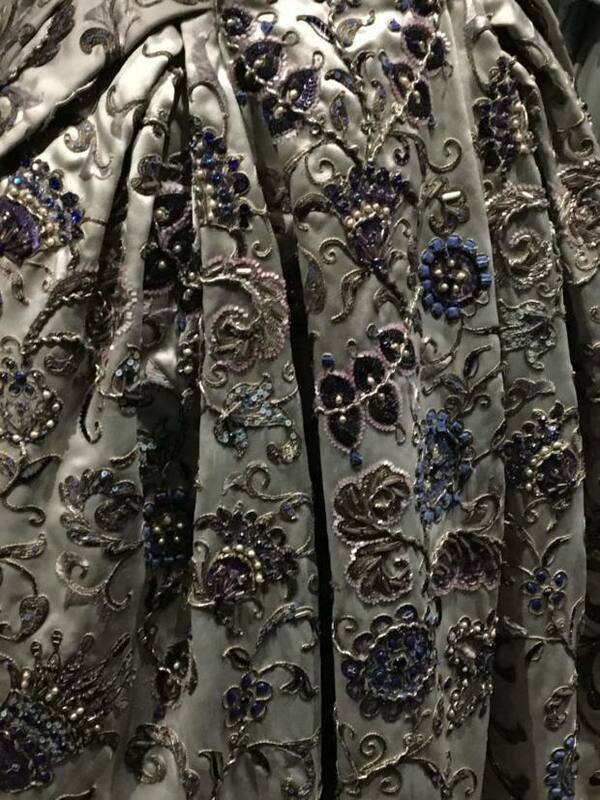 These include a wonderfully rich example of silk shading on a gown with an impossibly tiny waist and a very decadent textured jacket. 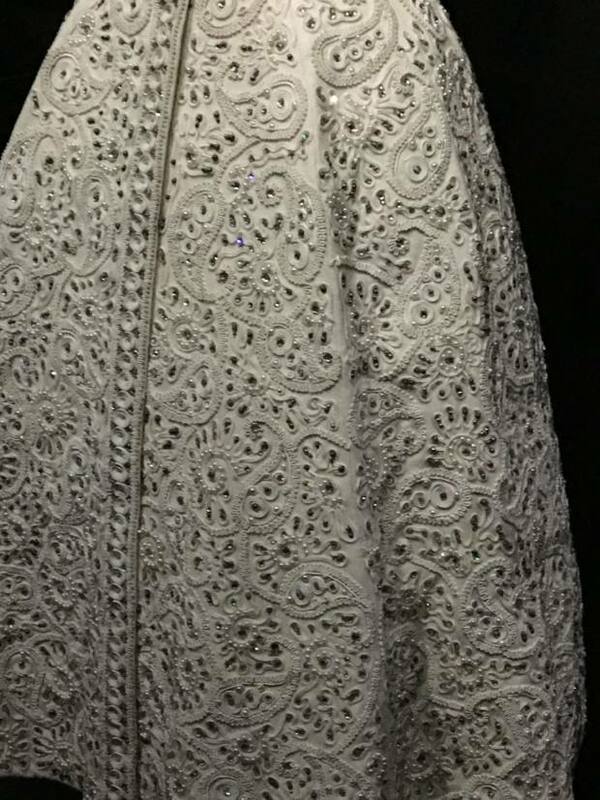 The base embroidery of the jacket is demonstrated by an embroiderer from Paris based embroiderers Lesage recreating the design. 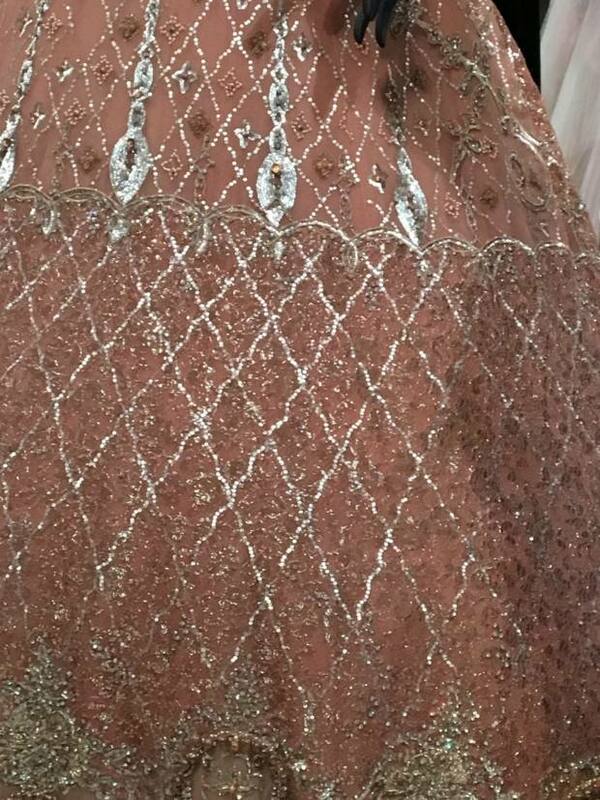 See below for a snippet of the tambour beading over long silk stitching. 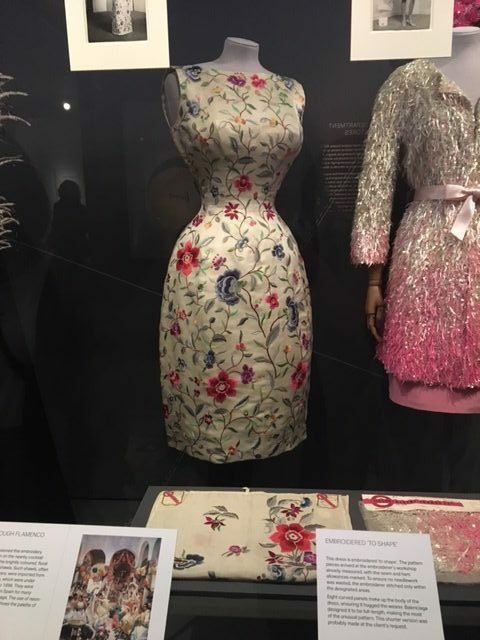 Going through the exhibition, the different approaches to each of the pieces are explained as Cristobal Balenciaga applied both tailoring and dressmaking techniques to his pieces. He was know for his surgical precision, often pictured in a lab coat measuring and remeasuring sections. 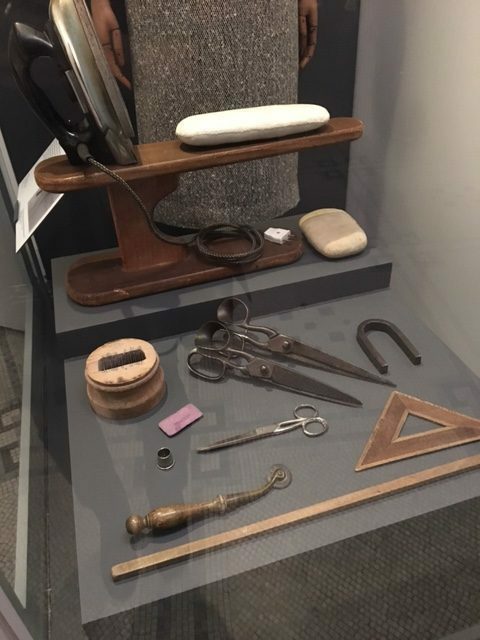 A selection of traditional tailoring tools are displyed including shears, pressing ham, chalk shaving box and tracing wheel. Cristóbal Balenciaga at work, 1968, Paris, France. Photograph by Henri Cartier-Bresson. © Henri Cartier-Bresson/Magnum Photos Moving upstairs, the exhibition focuses more on Balenciagas lasting legacy and those he has inspired. 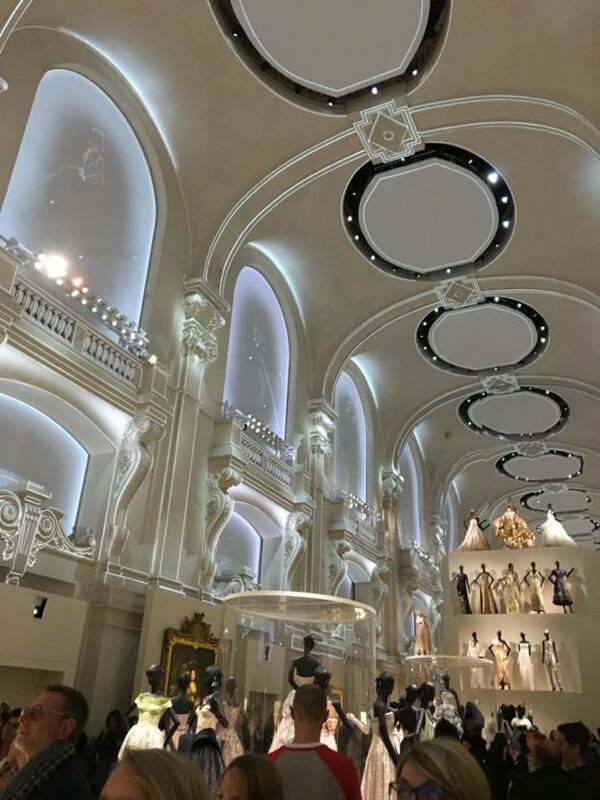 Against the dombed ceiling, three videos of current designers such as Mollie Goddard and Gareth Pugh who speak about how Balenciaga has influenced them and their design work. 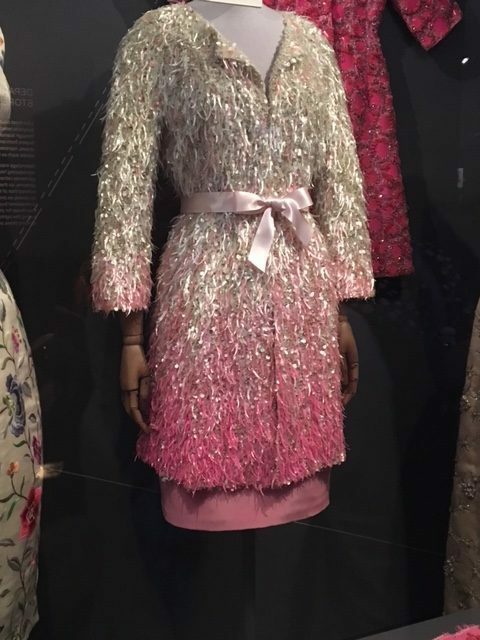 A series of parallels are drawn between contemporary designs and historical Balenciaga pieces such as the below by Hussein Chalayan and Oscar De La Renta which are likened to textured coat and silk work dress previous mentioned. 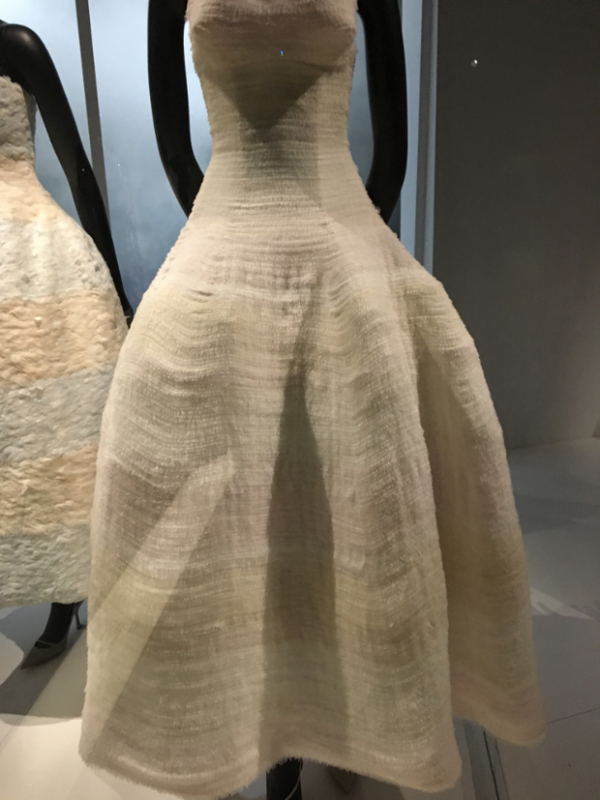 This exhibition is a well rounded insight into the Balenciaga brand with lots of lovely couture examples and the technical specification to go with them which is interesting for those with and without exisiting fashion knowledge. 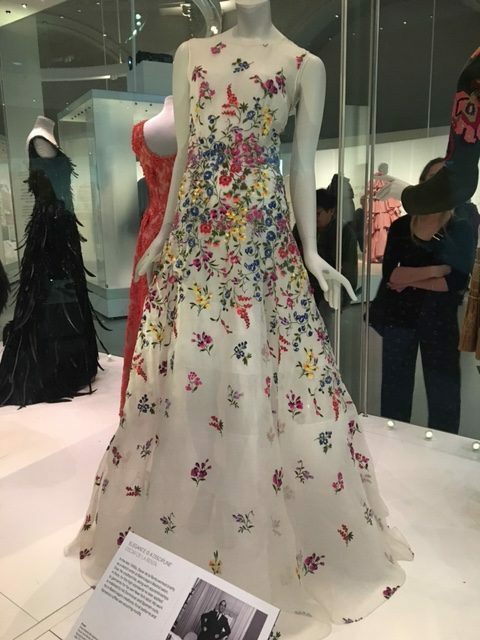 Balenciaga: Shaping Fashion will be running at the Victoria and Albert Museum‘s Fashion and Textiles Gallery Space (Room 40) until Sunday 18th February 2018 so if you have the opportunity to see it, it is worth the visit. Tickets cost £12.00 and some concessions are available. All images and videos courtsey of Natasha Searls-Punter (@tashasearlspunter) unless otherwise stated. 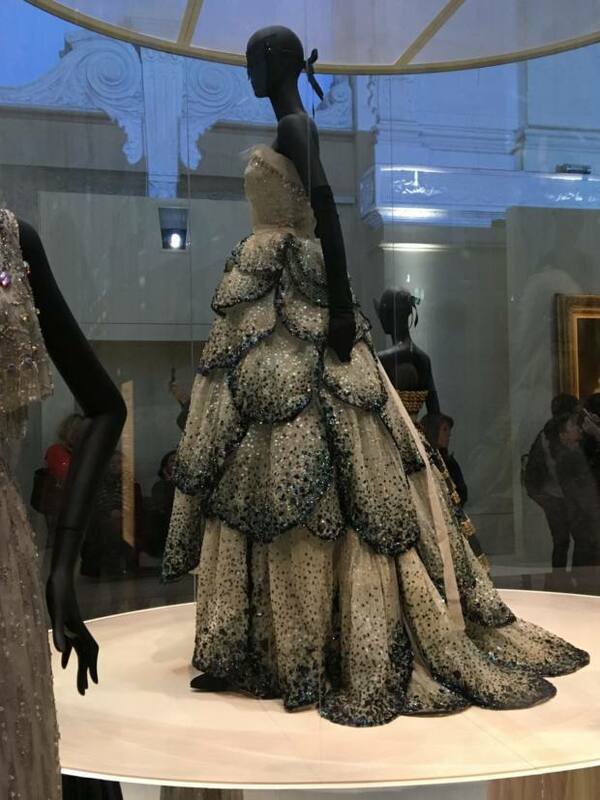 The Victoria and Albert Museum has such a great reputation for its fashion exhibitions and their new underwear epic ‘Undressed’ does not disappoint. 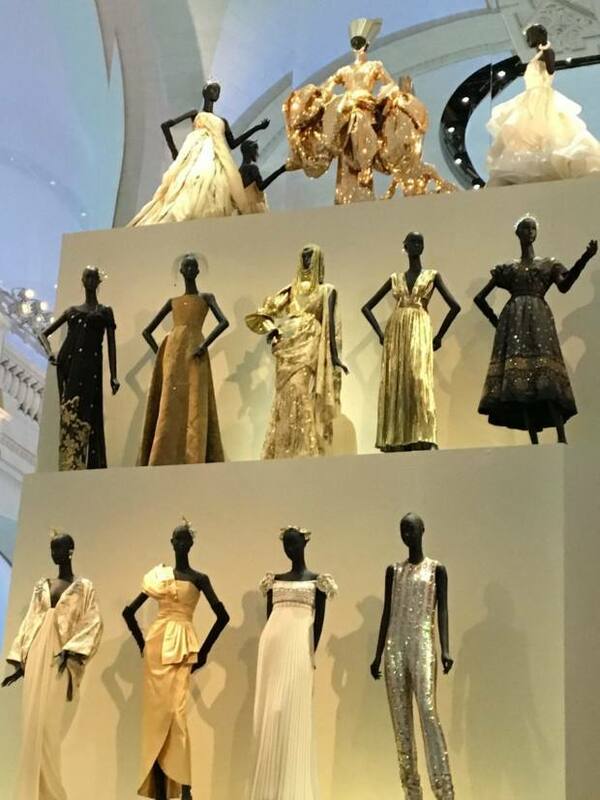 The exhibition is in the fashion section of the museum and is split between the historical pieces below and contemporary pieces on the first floor. For me the historical pieces are always the most intriguing as you start at the 18th Century corsets and work you way through. 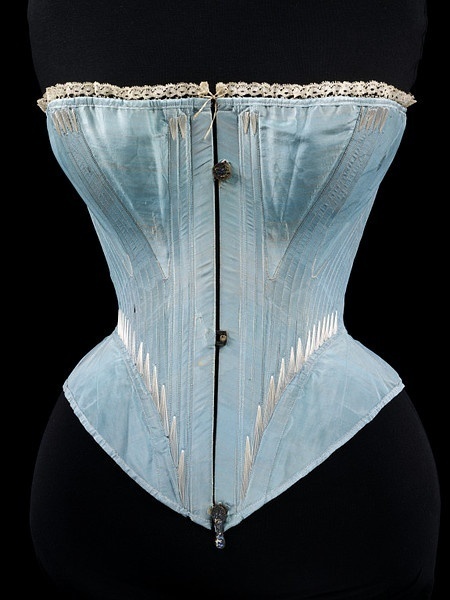 A great example of this is this baby blue corset made of cotton twill and silk lined. 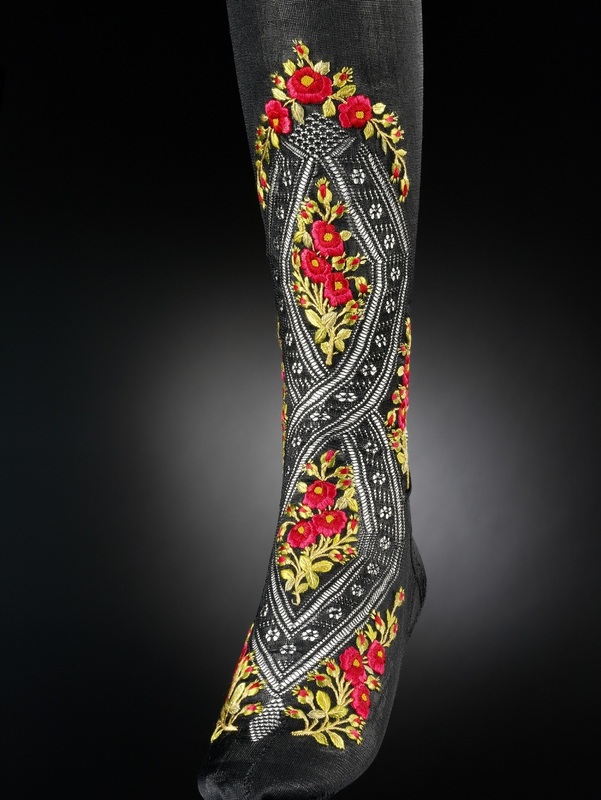 It is reinforced with whale bone and metal busk with machine lace and hand embroidery details. The embroidery on this piece is quite simple with the long fanned stitches around the hips and bust but it is very effective all the same. Most of the corsets are over 200 years old so it is amazing that they have survived to be displayed. 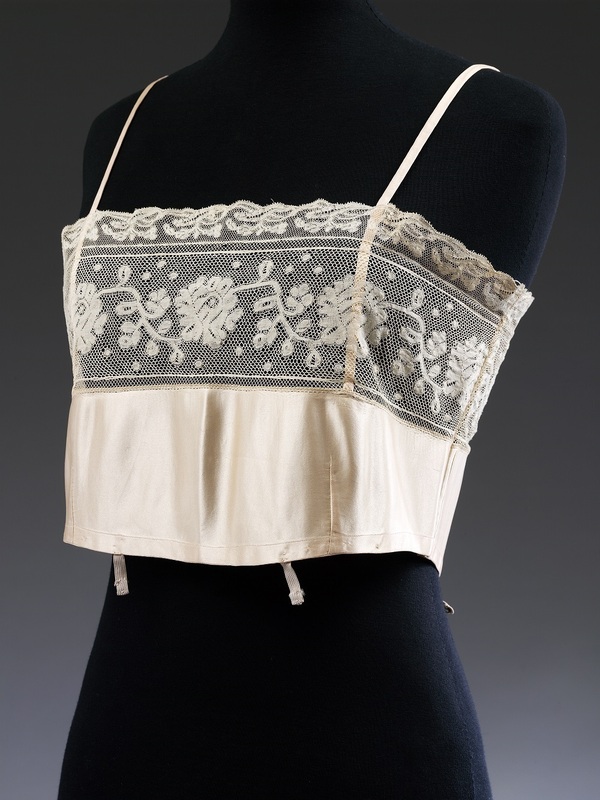 Moving forward there are some lovely lace examples from the 20’s and 30’s such as the above brassiere and negligee below. They demonstrate the development of the technology in this area and to see the intricacy that they were able to achieve. Along side the more prim and proper pieces are those which have a sense of humour such as the knickers pictured below. 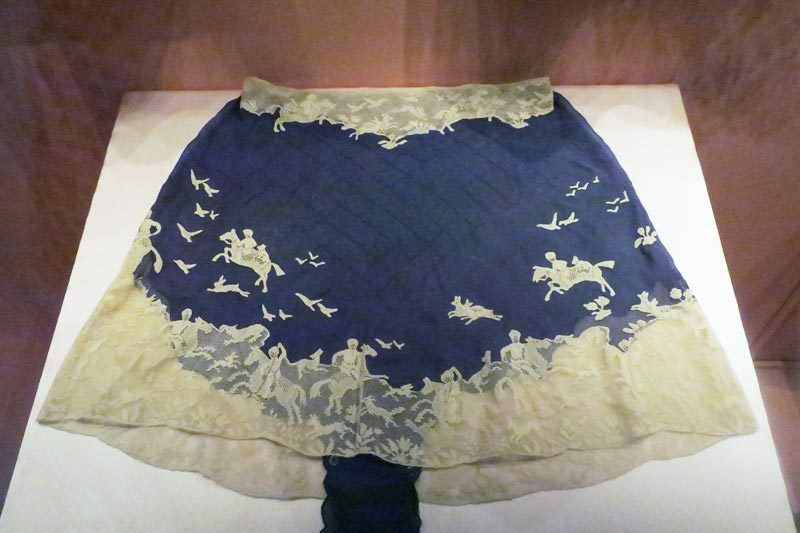 They belonged to a society Lady from the 1930’s who moved to the far east and commissioned these knickers as a fun item to have. They turned out to be to be quite useful, as the story goes, when she needed an ice breaker with other ladies she met, she would lift up her skirts and flash them a look at her hunting themed knickers to their great amusement. 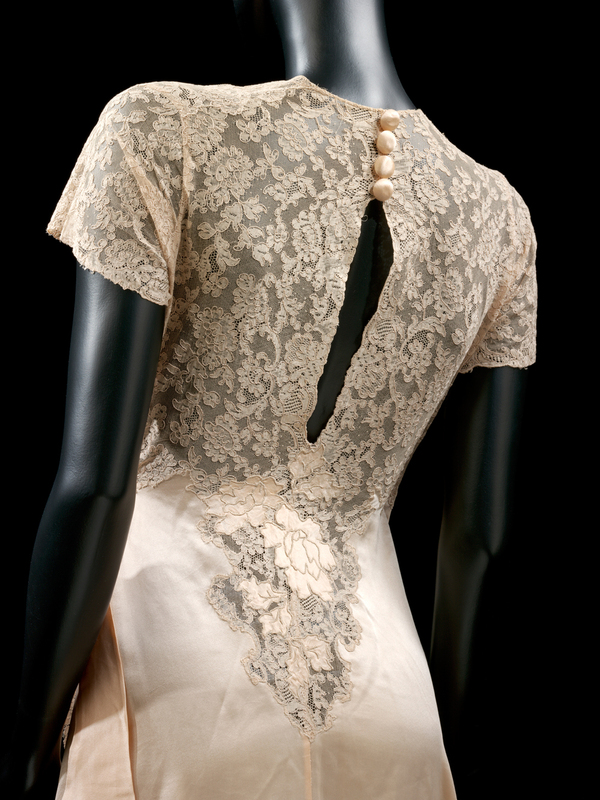 The hunting theme is achieved by lace applique of machine lace onto silk chiffon. The exhibition also offers a selection of garters, stocking and other underwear additions as well. 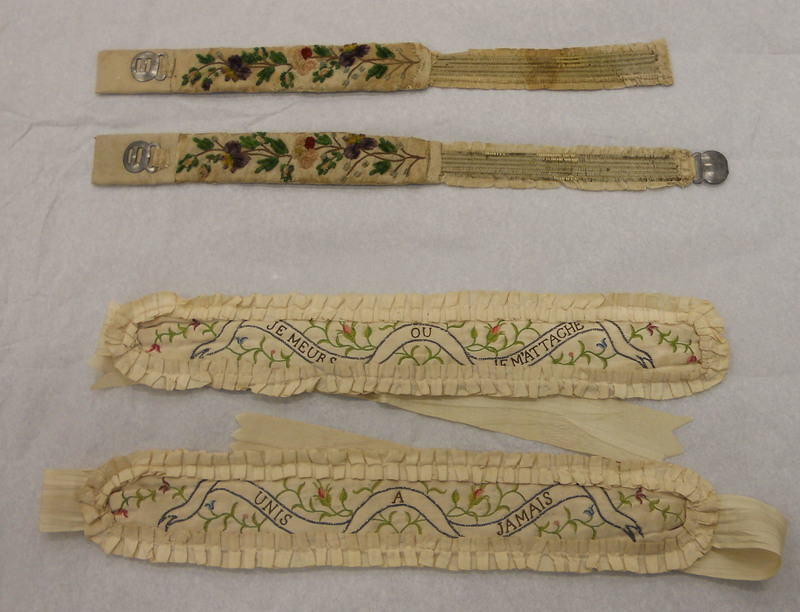 There are some great examples of embroidery on these as there are greater opportunities to be create with them. 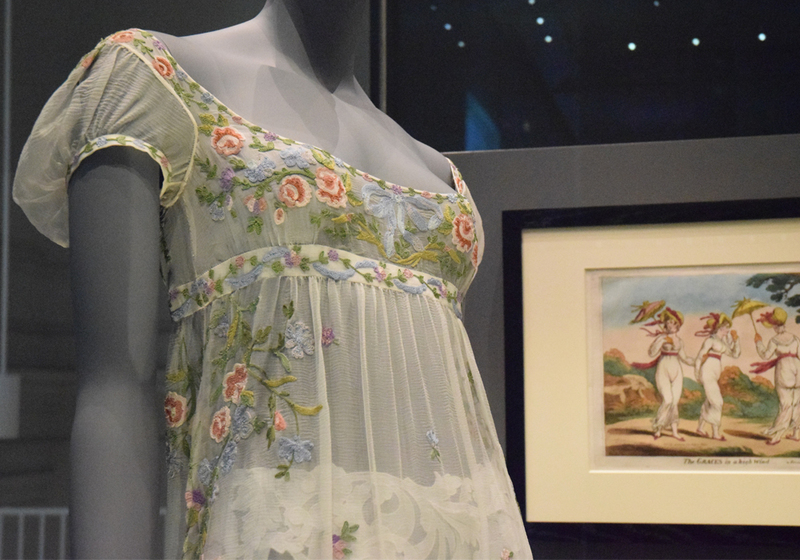 Moving upstairs, the focus is more on how underwear has progressed and its other interpreations such as into outwear. 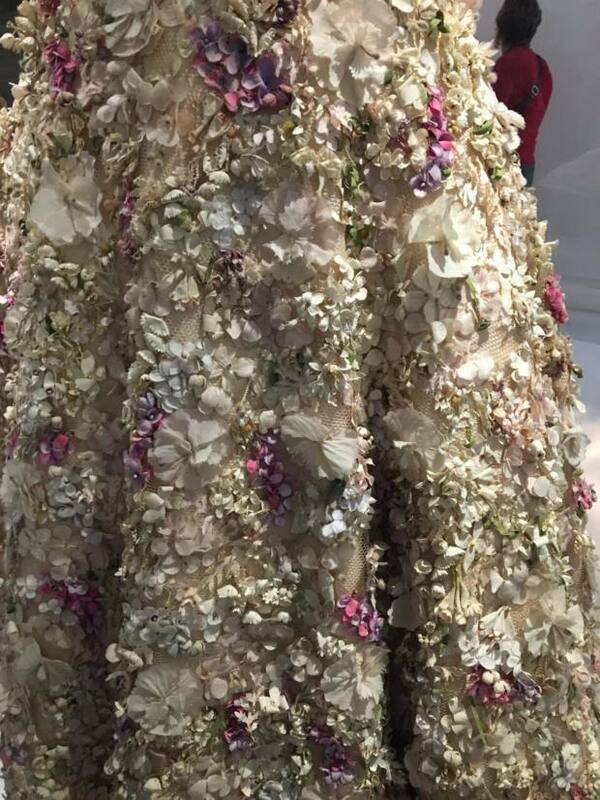 The piece below is reminisant of 17th Century fashion but is a piece from the Galliano show for Givenchy haute couture 1996 where underwear becomes outerwear. 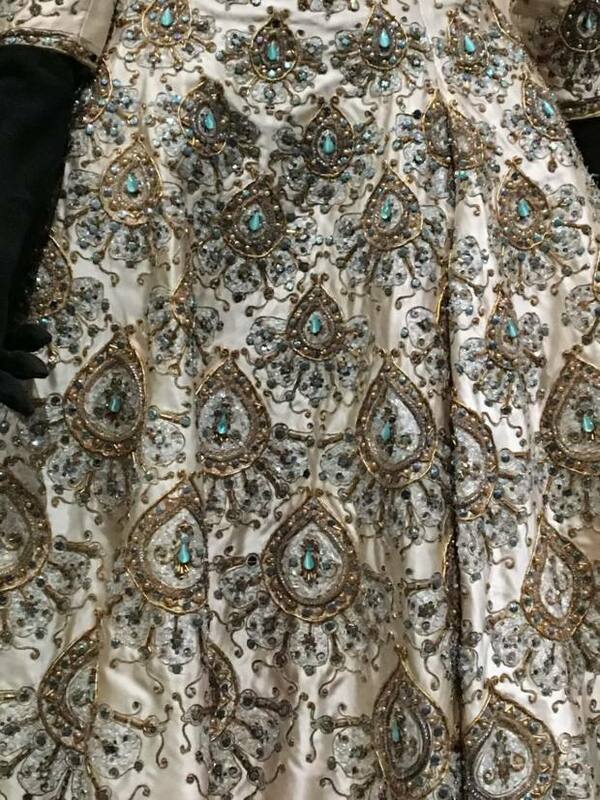 The embroidery on this piece is quite stunning with the romantic colouring of the stitching onto sheer muslin. 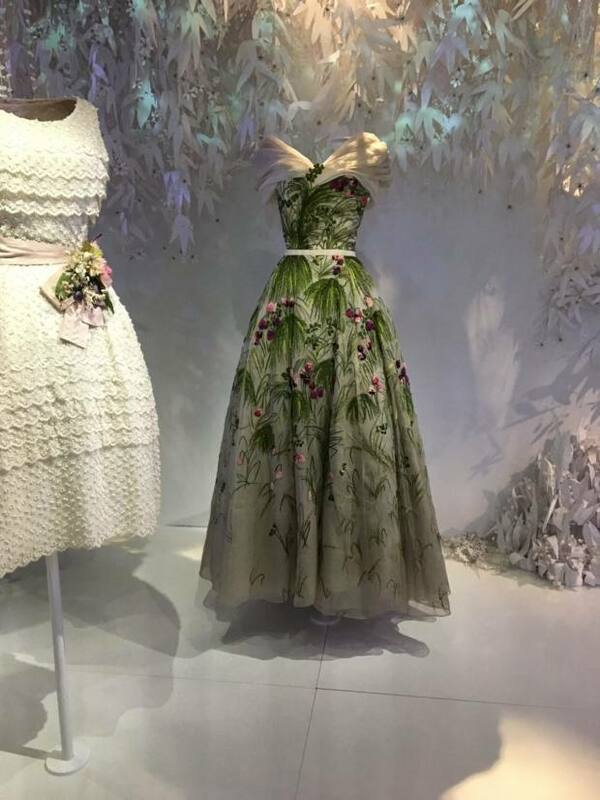 There is also a short video with interviews and insight into the design process with designers such as Fifi Chachnil and La Perla if you need a little sit down after all the lingerie. 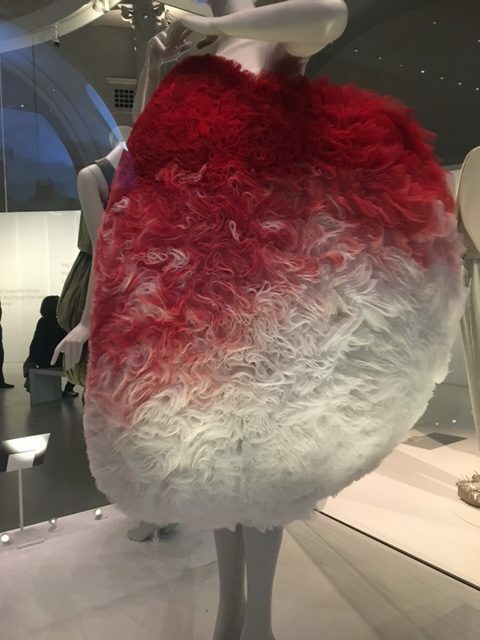 Undressed: A Brief History of Underwear is at the Victoria and Albert Museum, London SW7, until 12 March 2017. vam.ac.uk. 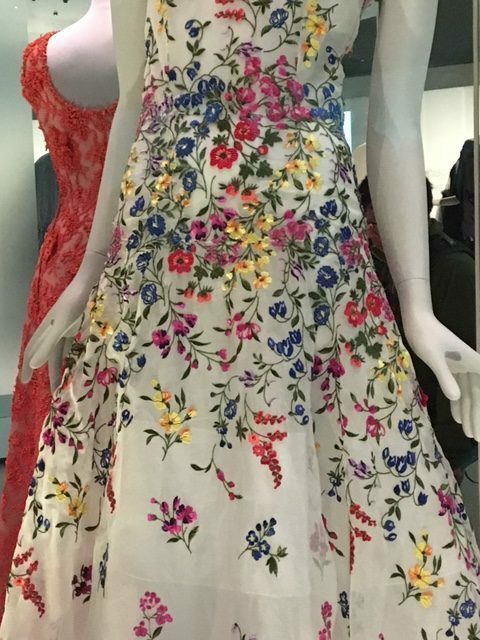 Click here for another review from respected Dress historian Lucy Worsley for the Guardian.